Marathon runners have been sporting compression socks for several years. Knee-high socks, however, don't occur naturally on trails, and have been known to scare away small animals and potential mates. Maybe that's why trail runners have been a little slower to adopt the look. Now compression technology is hitting the roads and the dirt as compression calf sleeves were all the rage at this year's Gore-Tex TransRockies Run. Team Salomon not only raced in the stylish black-and-silver-patterned sleeves, but relaxed and recovered in them, too. A few other runners sported the colorful Zensah sleeves. 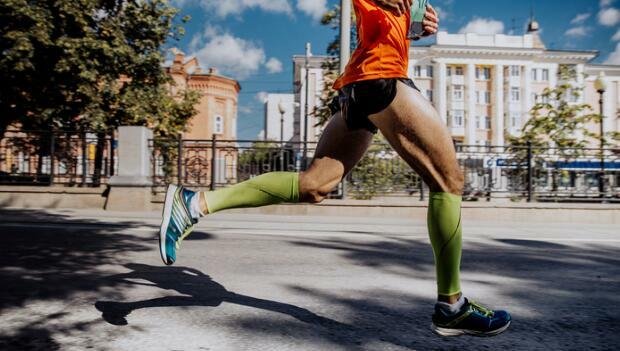 The makers of the expensive products tout the performance benefits of compression technology, but in terms of science, compression calf sleeves are kind of like ice baths. The people who use them swear by them. The people who study their effectiveness? Not so much. Even though some reports show the benefits may be more in my head than my legs, I've been wearing compression calf sleeves for the past month. My legs feel fresher during and after my long runs, and whatever the reason, I'll take it. If you're not quite ready to shell out the average $40 to $60 cost for calf sleeves, I've come up with a few other justifications to rationalize the purchase that don't depend on science. Coolness: No they don't keep you cool, but the Team Salomon guys looked pretty darn cool in their Salomon EXO III calf sleeves. A couple of tips before you make a purchase: Don't buy white (see item #3). Also, make sure you measure your calves for proper sizing. Too tight and they're uncomfortable and impossible to put on. Too loose and they don't provide enough compression and slide down on the trail. If you're convinced that compression leg sleeves are worth a try, here is a review of the Zensah Compression Calf Sleeves and a review of the RecoFit Compression Calf Sleeves.